Root to stem, farm to table, hyperlocal, nose to tail…this sustainability subject isn’t no ash in the pan and too right too. From last year’s introduction of exitarians to the signi cant rise of veganism, there’s a clear demand for plant based diets. Whether you’ve made your mark by adding wonky veg to your mealtimes or following a routine of ‘meat-free mondays’, embracing the wonderful world of veggies and cooking with the seasons, is becoming part of our everyday lives. With a movement towards veggie centric plates, protein is taking a backstep and being used rather as a condiment in dishes. As veggies take a limelight on the plate, ‘root to stem’ cooking is also gaining momentum. And in simpler terms; this trend champions how you can cook with a vegetable and use it in its entirety. Don’t go throwing away those broccoli stalks, potato peelings and carrot tops, instead, nd a way to utilise them. What’s more, these offcuts that we normally cast away are normally laden with nutrients and minerals that your body will thank you for later. Taking this approach might even save you a few pennies and take the effort out of everyday cooking. Take the butternut squash by example, who enjoys peeling off this tough cookie’s skin? Next time, don’t bother. Chop up into bite size pieces with the skin still in tact and roast away – it’s delicious. We know that adopting ‘local’ isn’t a recent discovery – in fact, it’s been becoming fashionable over the last decade or so but just about every London based restaurant and foodpreneur wants front row now. Of course the average Joe can consciously try to shop local and when good ol’ Google offers a ‘near me’ feature, there’s really no excuse. But how is ‘local’ developing in the food scene? Well, it’s simple really, they are becoming ‘hyper-local’. This means produce emanating from restaurant gardens, onsite beer brewing, house made items (utilising waste products) and even menus that only use produce from a 1 mile radius. Give this root to stem recipe a trial and see how easy (and enjoyable) sustainable cooking can be. Slice the red cabbage into steaks, drizzle with oil and salt, roast in the oven at 180 until cooked. On the same tray cook the diced sweet potato. 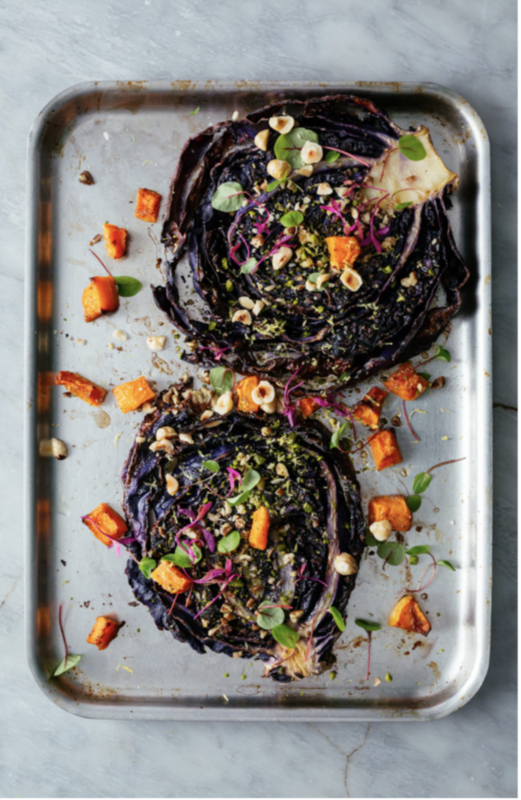 On a serving plate layer the cabbage steaks and sweet potato, sprinkle over chopped hazelnuts. If you wanted to bulk out the salad some bitter leaves can be a great addition to this dish. Make the dressing and drizzle.